The Namib Desert is the oldest and most arid desert region in the world, having been around for more than 80 million years. In the Nama language, 'Namib' means 'vast'. This description perfectly suits the miles of barren landscape stretching endlessly along Namibia's Atlantic coastline. In the north, the Skeleton Coast lies as an intensely mysterious, inhospitable area of treacherous rocks, sandbanks, dry gravel plains, and isolated, flat-topped mountains. The bleak wilderness is especially eerie when blanketed in thick coastal fog, brought about by the collision of the cold sea air and searing heat of the harsh interior. Over the centuries, shipwrecked sailors soon joined the whale and seal skeletons which littered the coast, having no chance of survival in the wastes of the Namib Desert. Its appeal lies in its untouched quality, the colours and changing moods of the large landscape, and the flora and fauna's incredible adaptions to desert life. The southern Namib forms part of the Namib-Naukluft Park, one of Africa's most interesting and diverse nature reserves. It includes Sandwich Lagoon, an important wetland area for migratory birds, as well as canyons, rivers, and the Naukluft mountain massif. It is home to many animal species, particularly the Hartmann's mountain zebra. This section of the Namib Desert is characterised by an endless sea of orange sand dunes, and the famous Sussusvlei dunes, which are the highest in the world. Situated along the coast, the charming little seaside resort of Swakopmund emerges from the desert stretch. 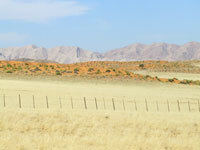 Its distinctly German character and old world charm makes it a great base for any holiday in the Namib Desert.